Fish that lay eggs on dry land. Birds that navigate for thousands of miles without a compass. Bats that swoop through total darkness without the slightest bump in the night. 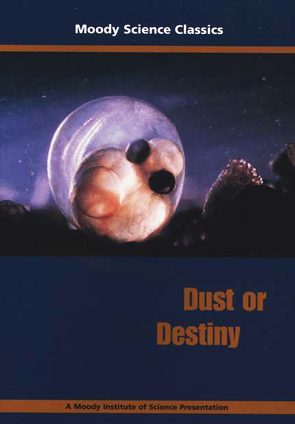 In Dust or Destiny, you’ll marvel at the some of the world’s most astonishing natural wonders and learn how each of them gives fervent testimony to the fact that this planet was not formed from ordinary dust, but by the hands of a living God. For more than fifty years, Moody Science Classics have unfolded the miracles of nature's mysteries while showing how the wonders of creation reveal the majesty of God. School-aged children through teens as well as parents and teachers will gain a fresh appreciation for the Creator and the intricate details of His handiwork, as presented in these award-winning programs. A wonderful supplement for teaching scientific principles in an easy-to-understand format and from a biblical perspective. I have purchased several sets of this whole series in my lifetime to give out. These are so well done, so spot on target with real science and God's Word. Very entertaining, excellent teaching and a great Bible Study in each DVD. Nuggets learned in these DVD's won't leave you or your children/students.